Nutley Lodge Care Home: Local Visits for 2019. Mount Batten on a summers day. 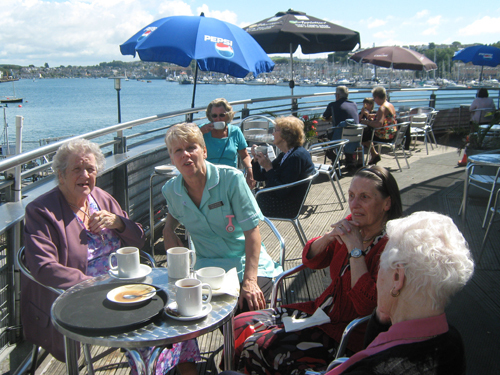 We have now resumed our 'Coffee Break' outings to local places normally hosted by Lynwen, Jeremy and a member of the care staff. Weather permitting most Tuesdays or Wednesdays we aim to have a cup of coffee out! We normally take 4 to 6 clients each time to ensure we are able to give them personal care and a more positive experience than taking a greater number of clients. We leave Nutley at about 11am and get back in time for lunch. In the past we have visited Saltram, Queen Anne Battery, Jennycliffe Cafe, Theatre Royal, The Mountbatten Centre, Tesco and Morrisons. Some more than once. Sometimes we ask families to assist and we always take a member of the Care Staff. We look forward to 2019 to resume this event. On Tuesday 22nd January we visited Stadden Heights Golf Club for coffee. On Wednesday 30th January we visited Morrisons in Plymstock for coffee and look round the new extension to the shop. On Wednesday 6th February we visited Mount Batten and the Sailing Centre. On Tuesday 12th February we again visited Morrisons. On Wednesday 27th we visited Jennycliffe cafe. On Wednesday 6th March we have a 65th Wedding Anniversary celebration. If the weather is unpredictable at we tend to visit Morrisons as it is close and better for our clients.